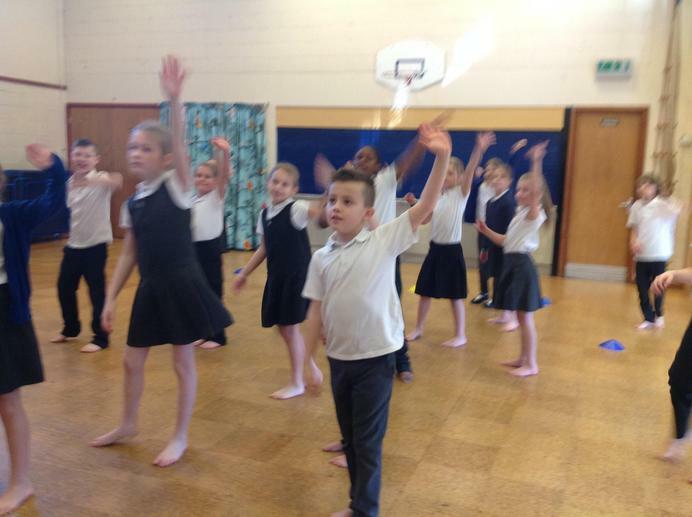 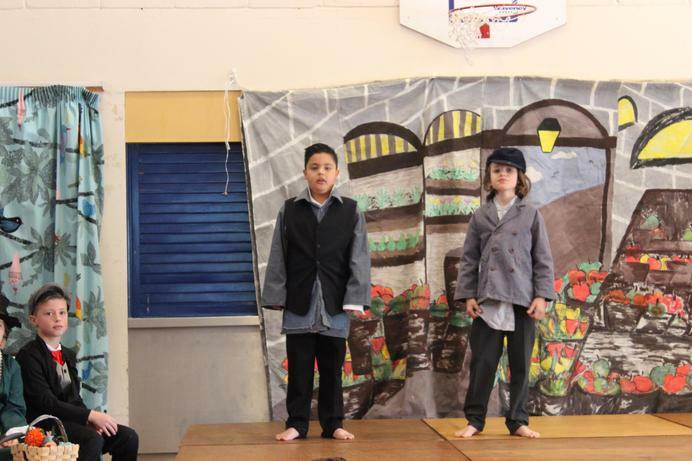 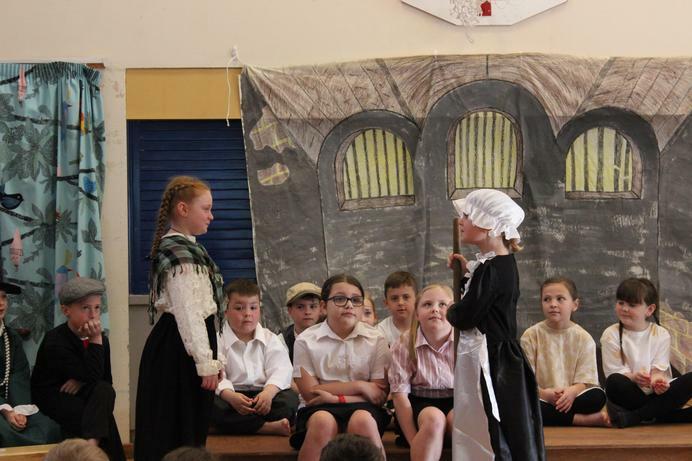 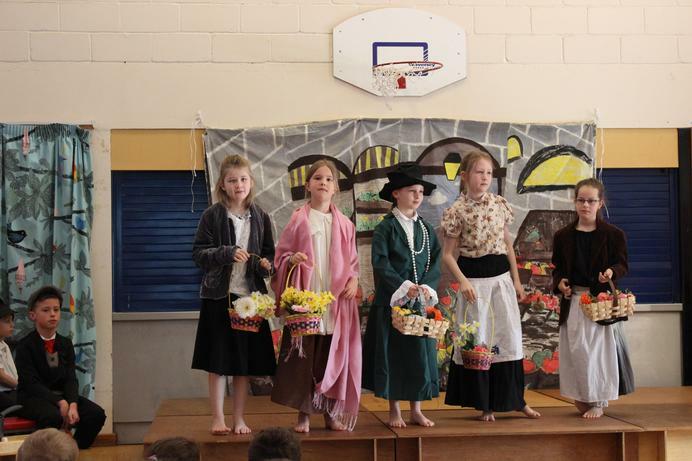 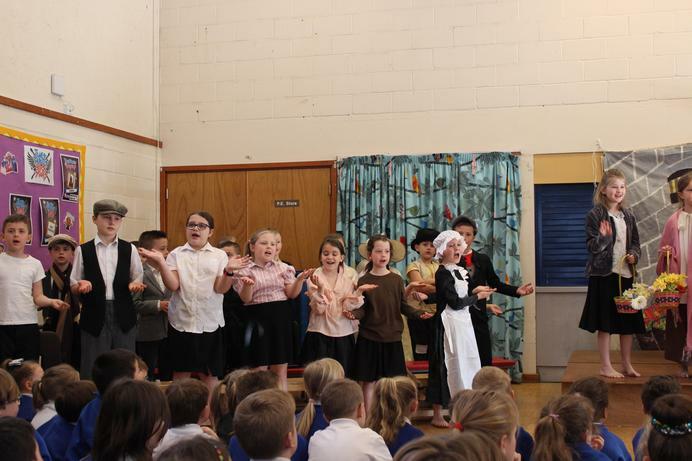 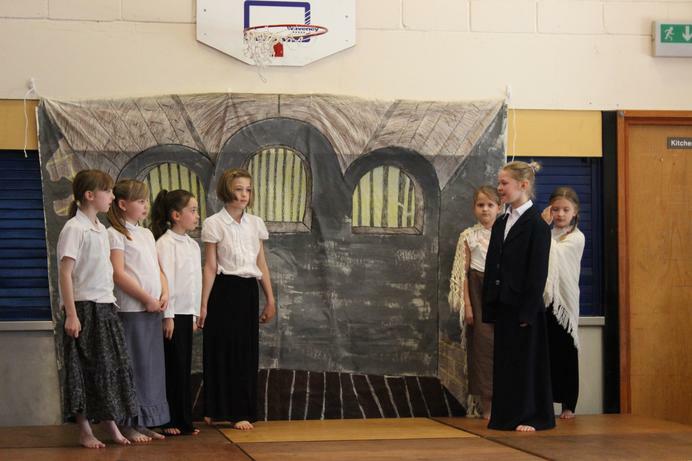 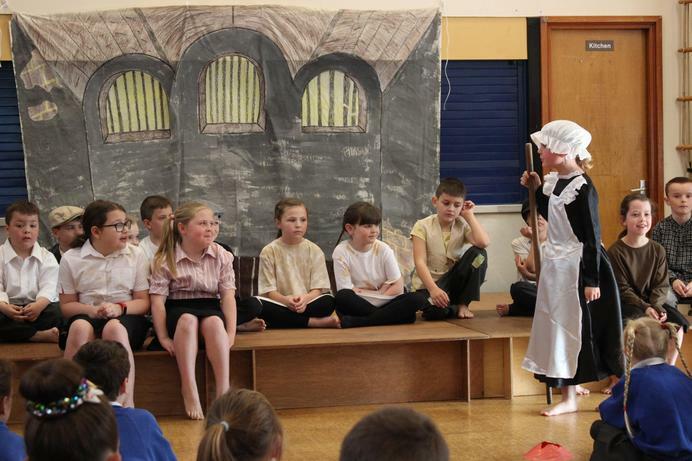 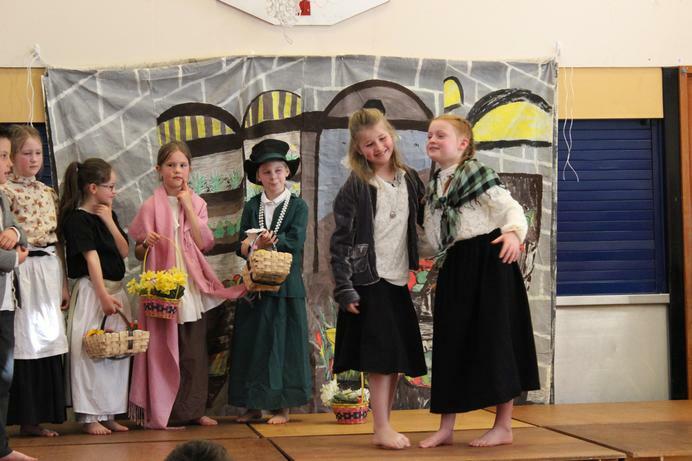 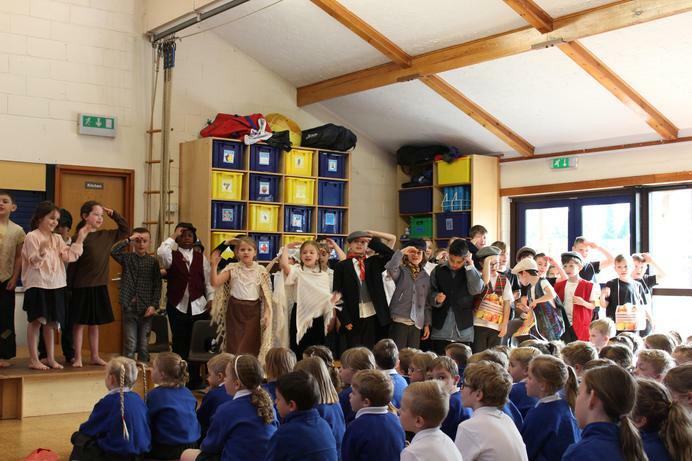 Initially, we grouped the classes together and showed them clips of another school performing the same production, to give them some ideas. 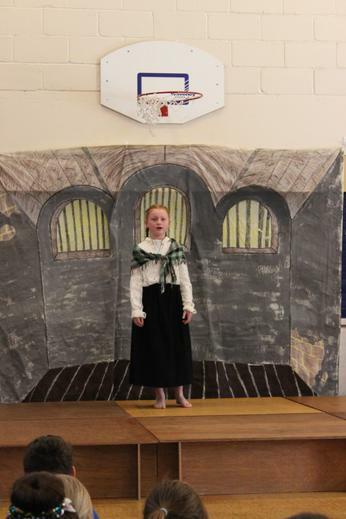 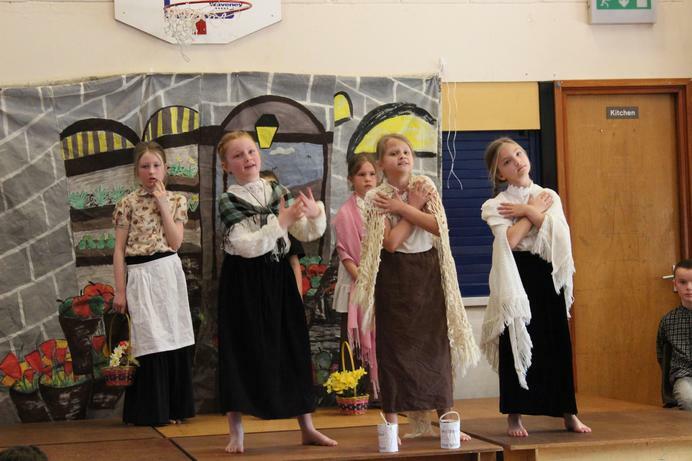 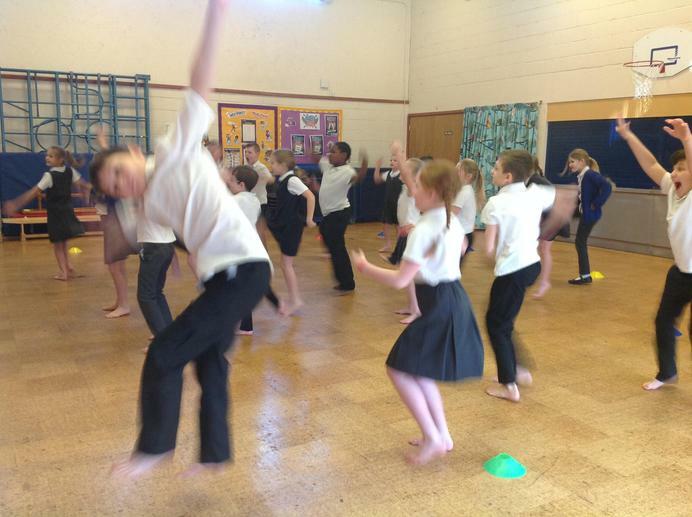 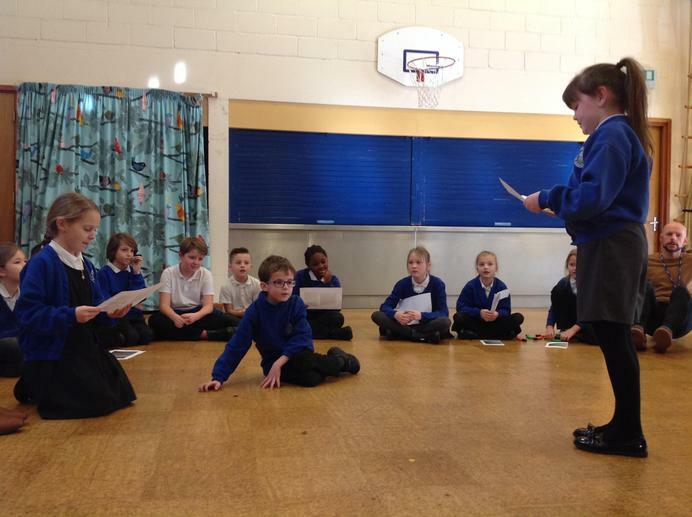 We then held singing auditions, gave out all of the parts and began rehearsing. 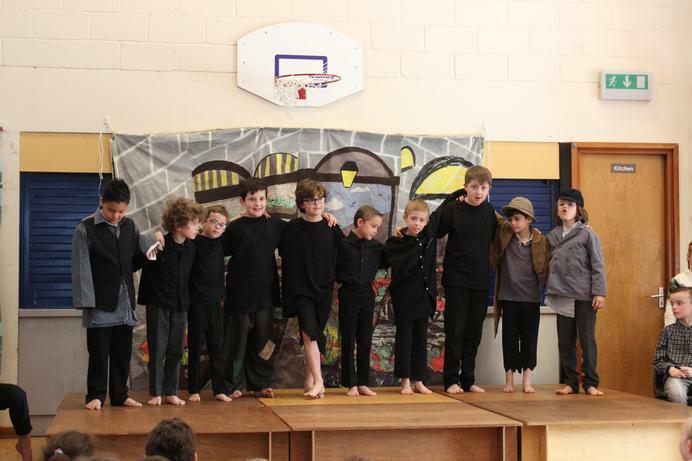 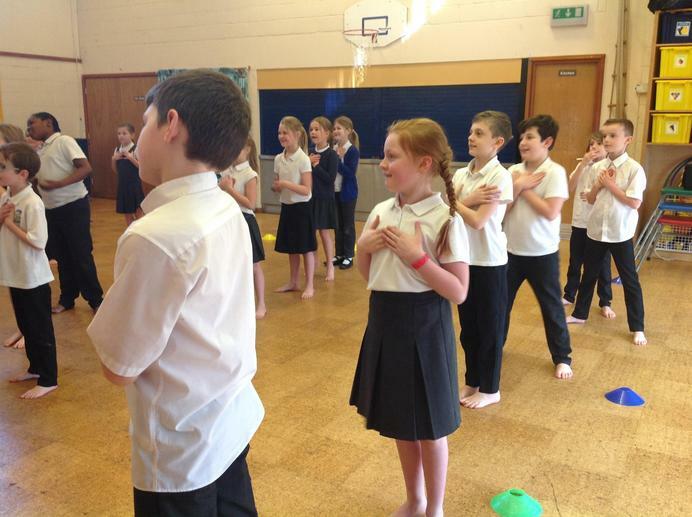 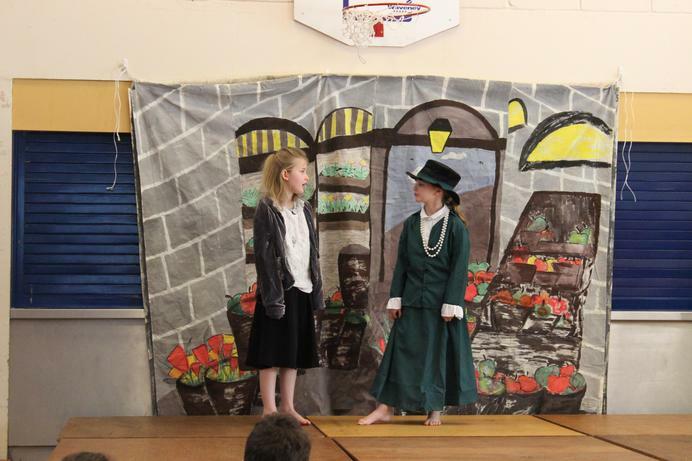 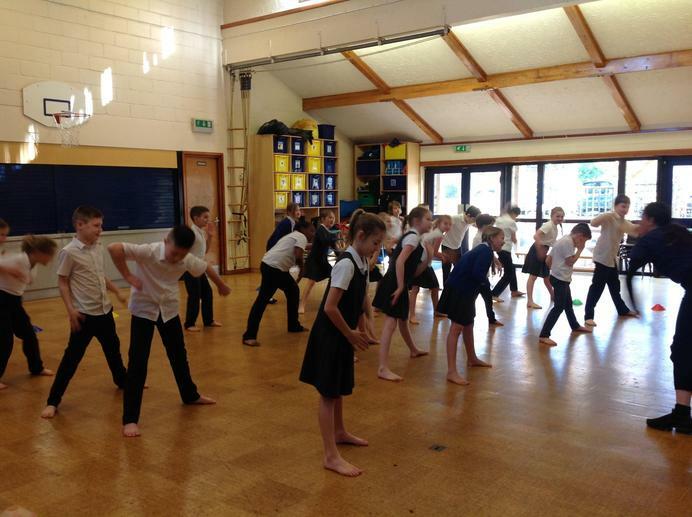 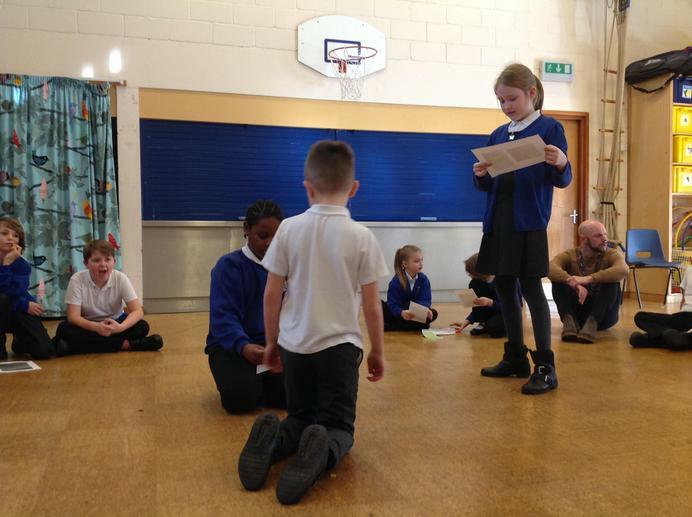 We started off by using scripts, slowly working out who was to stand where on stage and what was going to happen when. 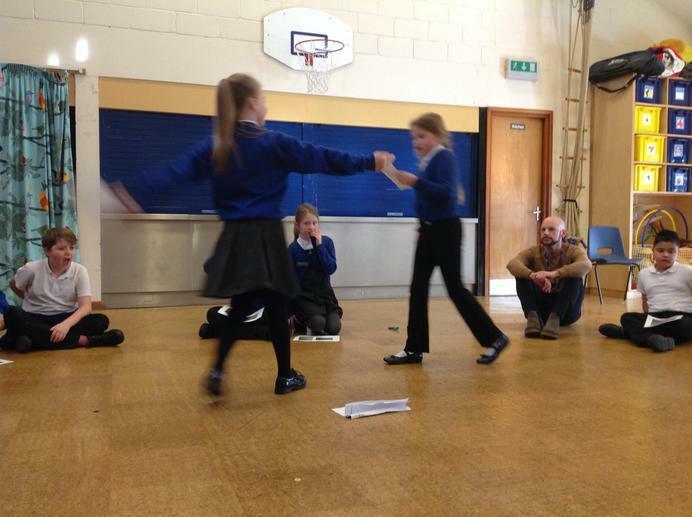 Towards the end of our rehearsals, we took the scripts away, got the school staging out and continued to rehearse the play. 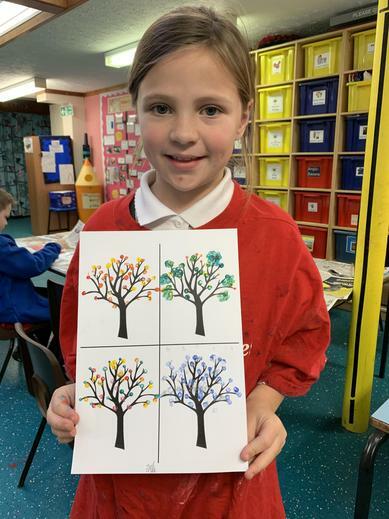 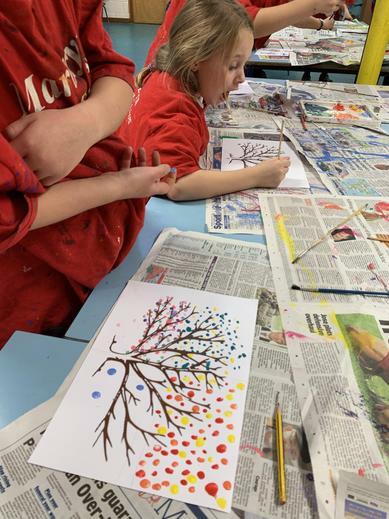 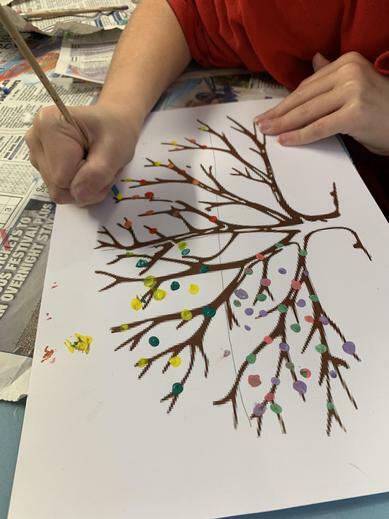 Creating beautiful 4 seasons calendars that we then sold at the Christmas fair. 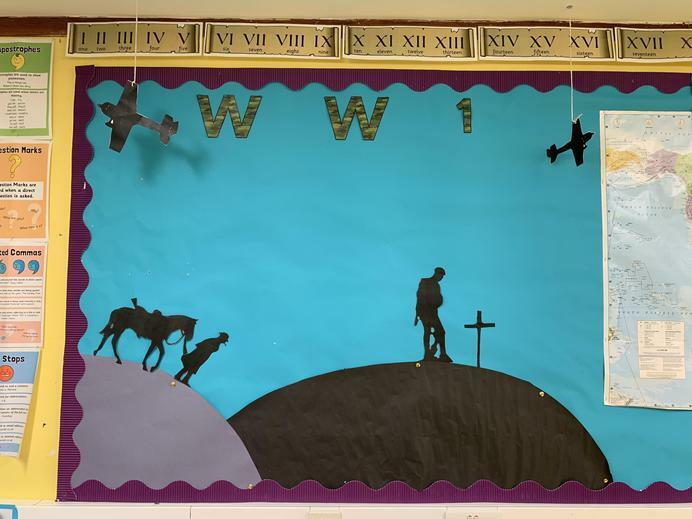 Learning all about WW1, from what happened if you were on the frontline, to what happened if you were still living at home. 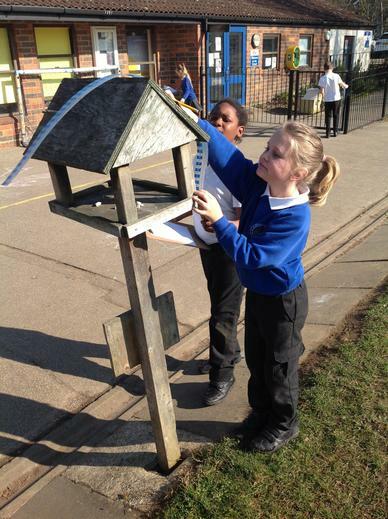 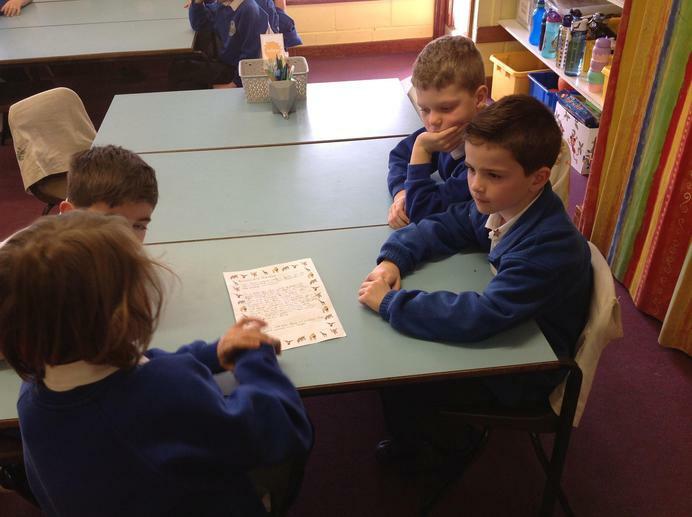 We even created and wrote our own tea-stained, heart-felt letters from the trenches. 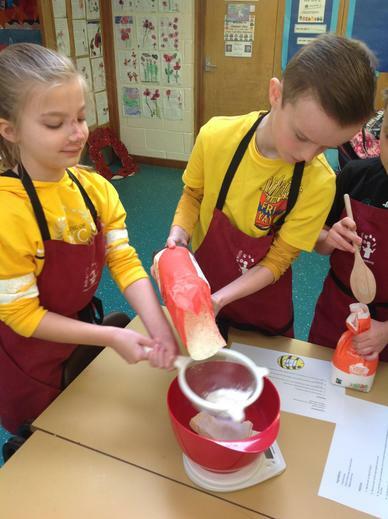 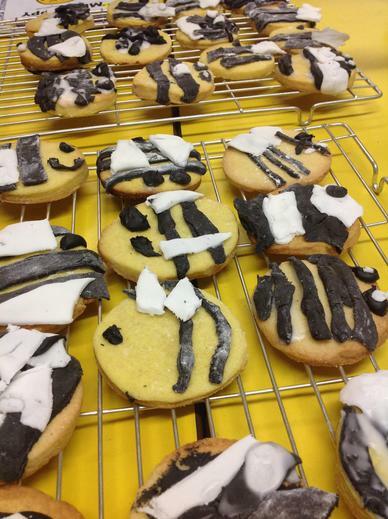 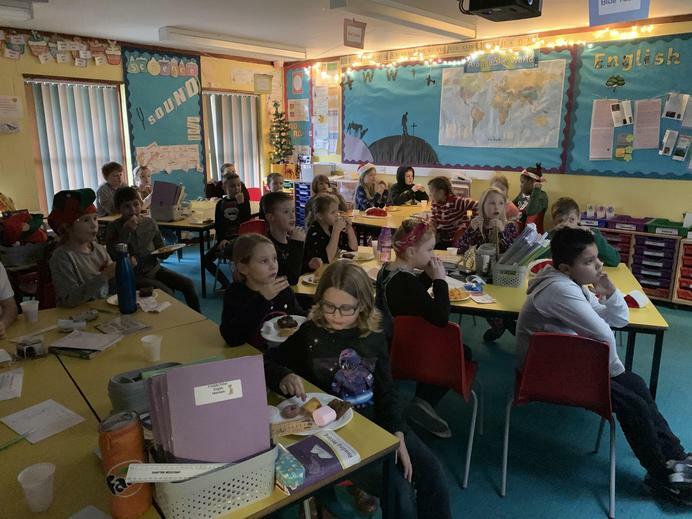 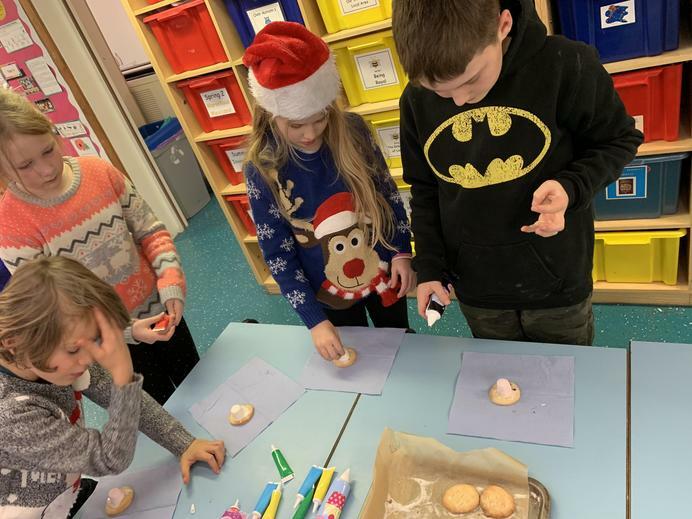 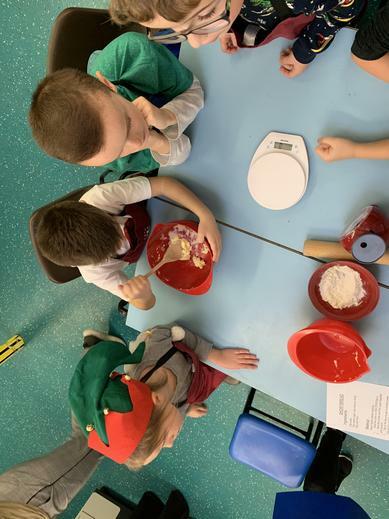 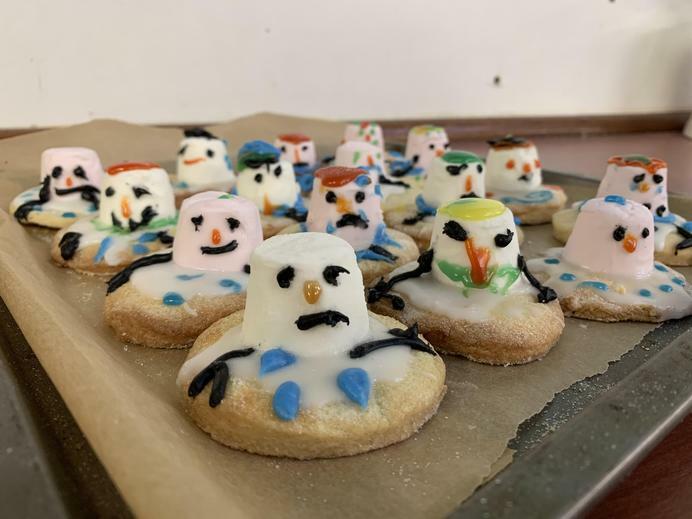 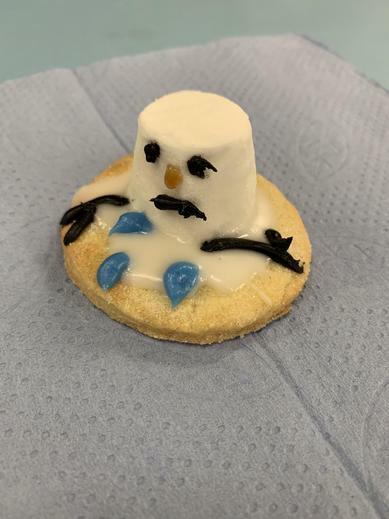 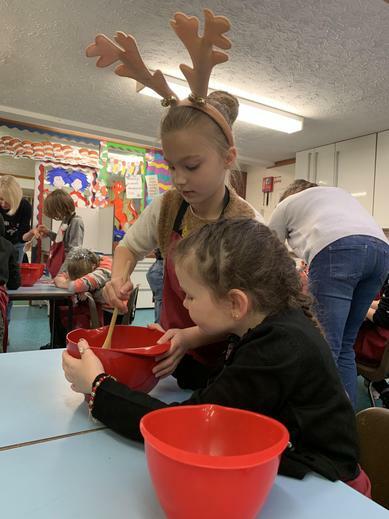 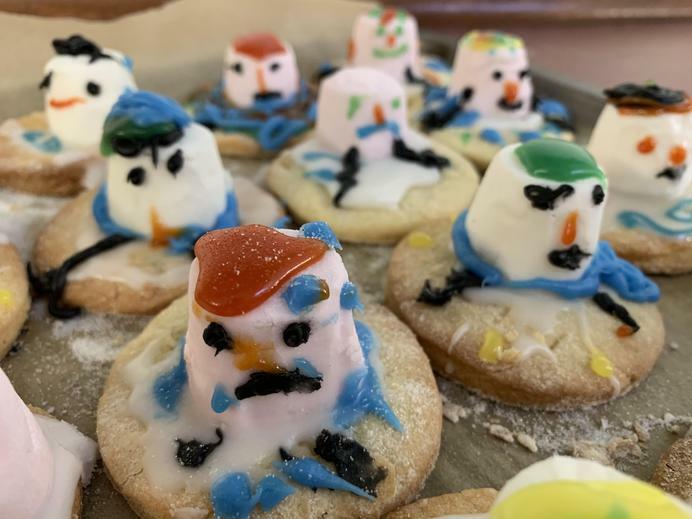 Having our own class Christmas party that included baking and decorating 'melting snowman' biscuits, a quiz of the year, watching a film and eating a few snacks along the way! 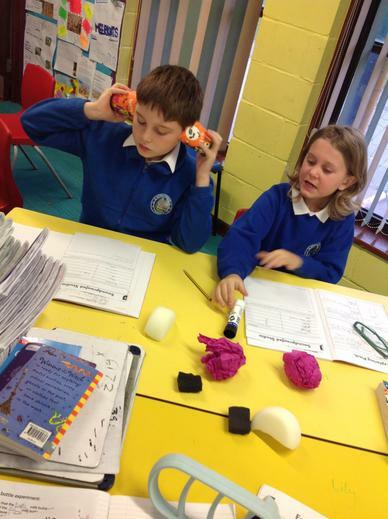 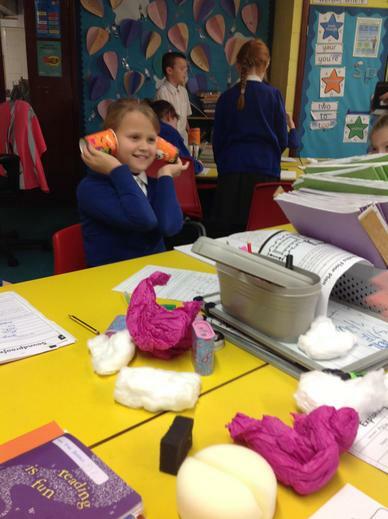 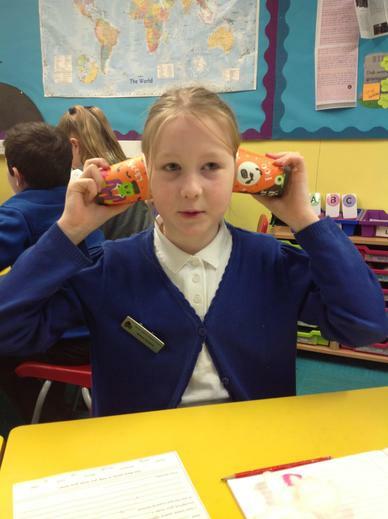 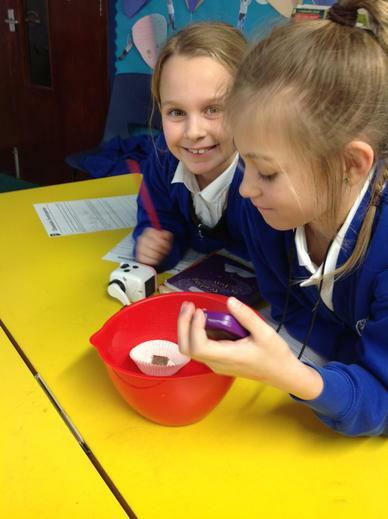 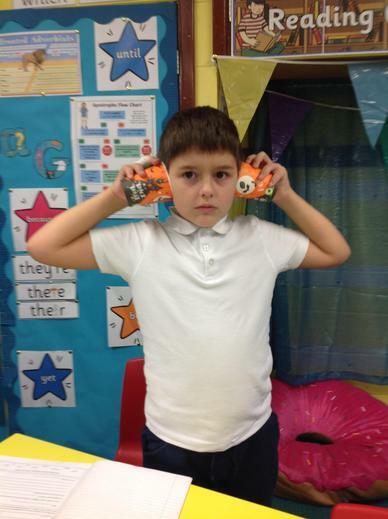 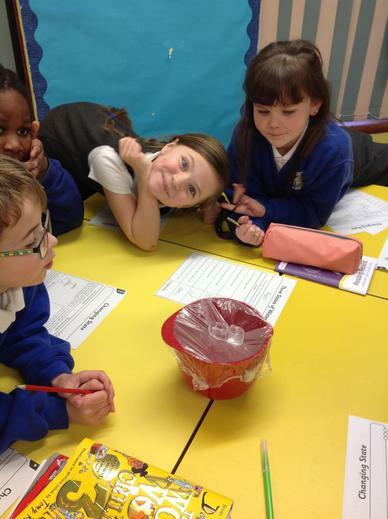 Finishing our topic on sound and creating a lot of noise (to investigate pitch, volume etc) in the process. 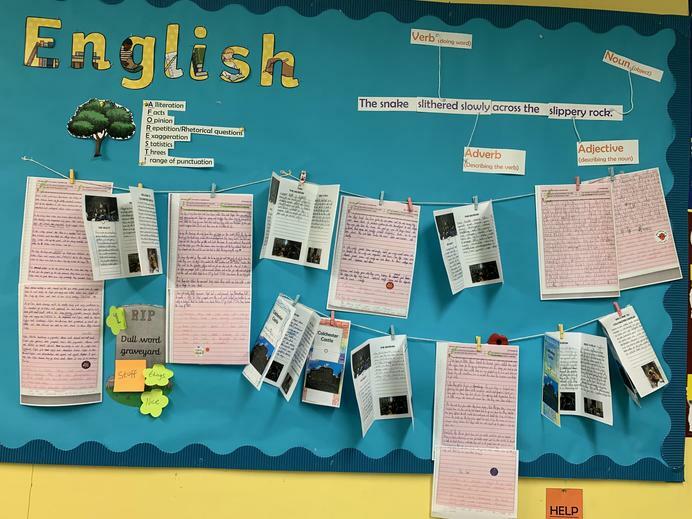 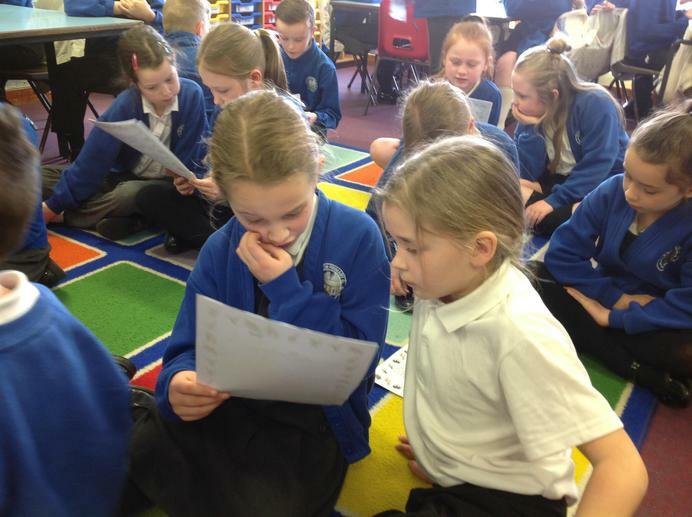 Writing beautifully laid out information texts all about an instrument of our choice. 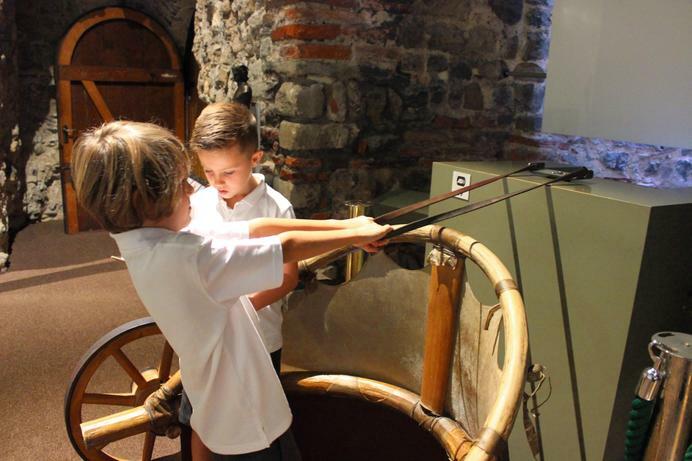 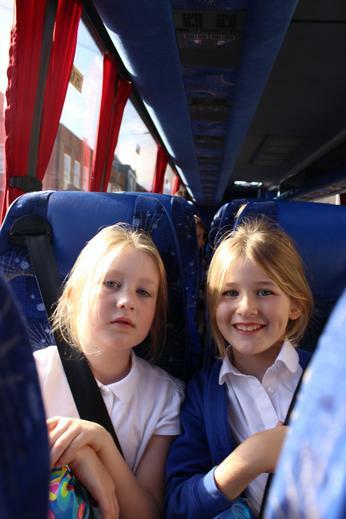 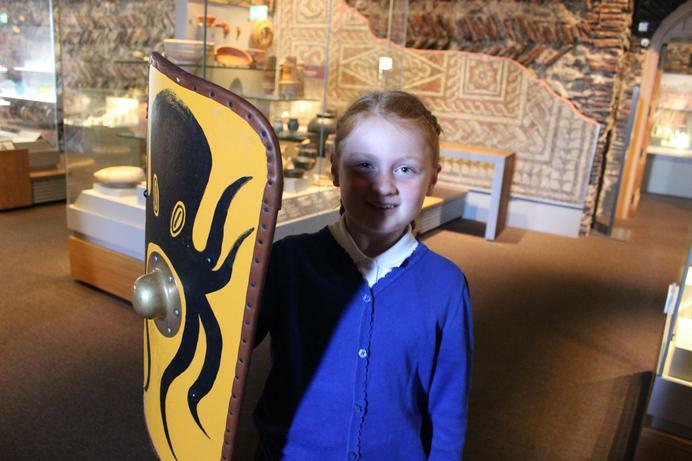 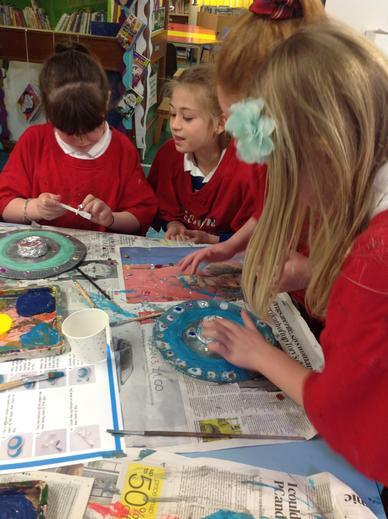 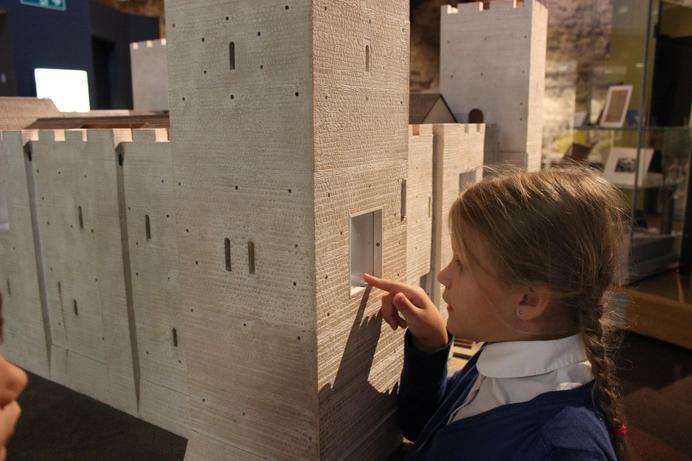 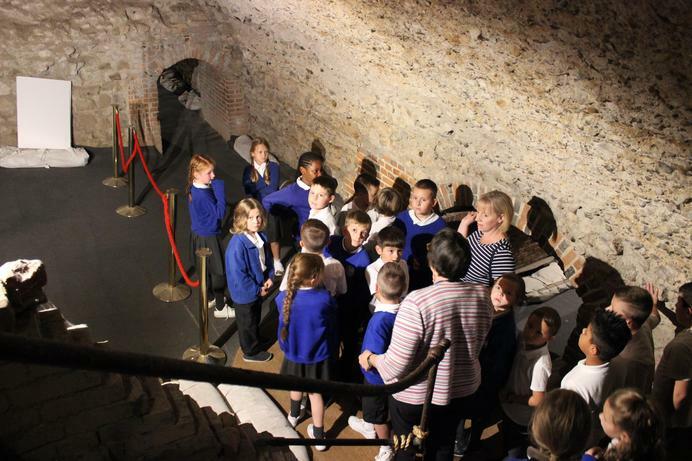 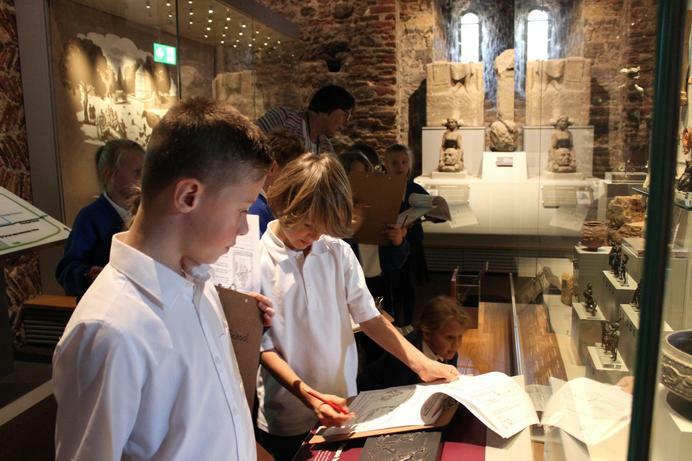 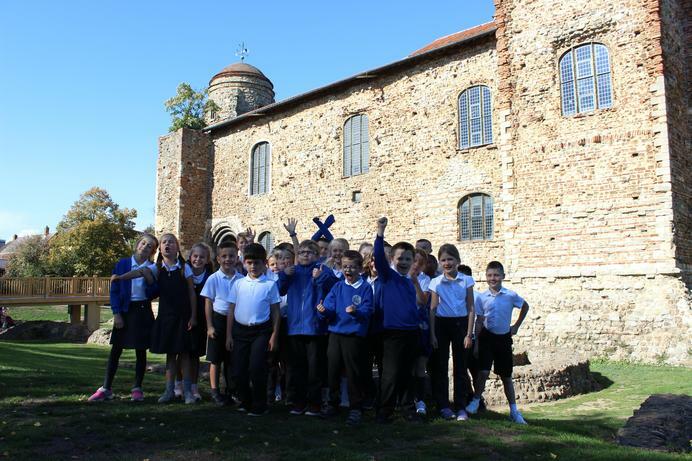 To tie-in with our Roman topic, we went on a class trip to Colchester Castle. 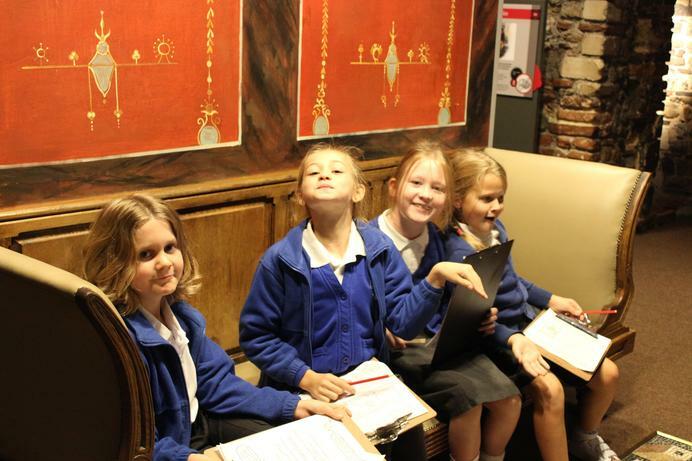 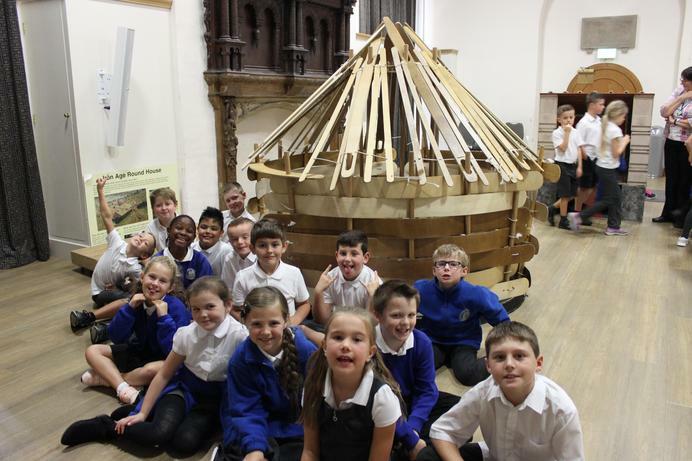 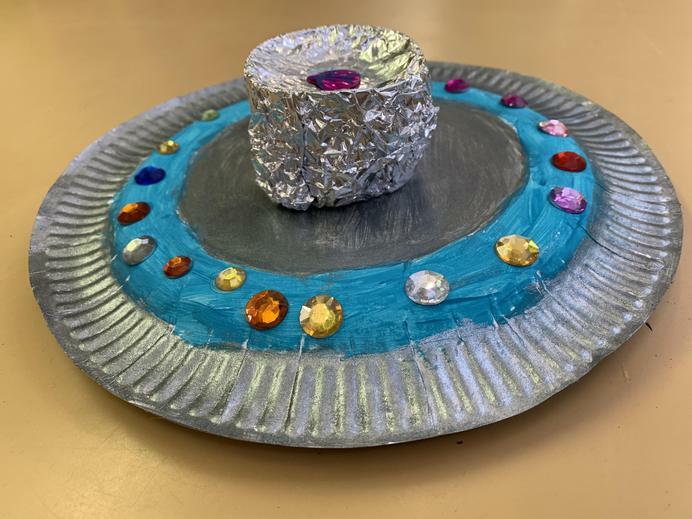 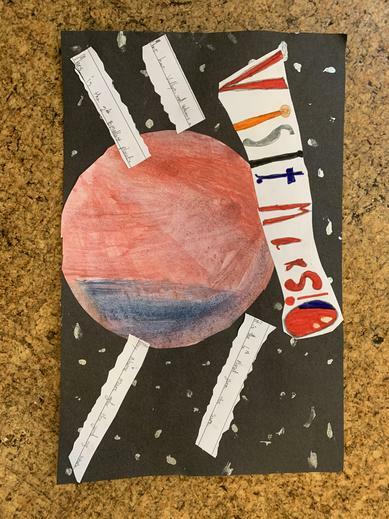 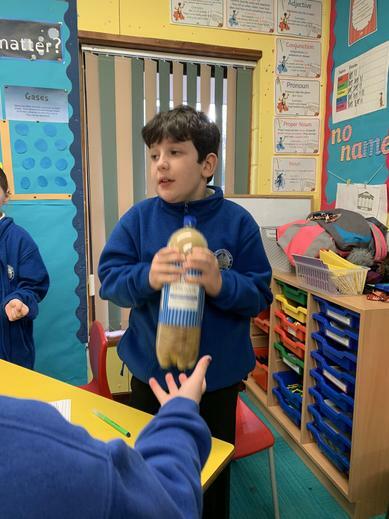 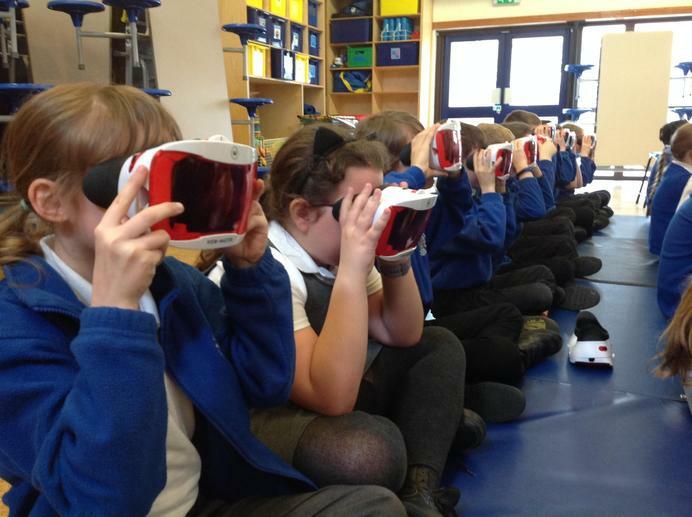 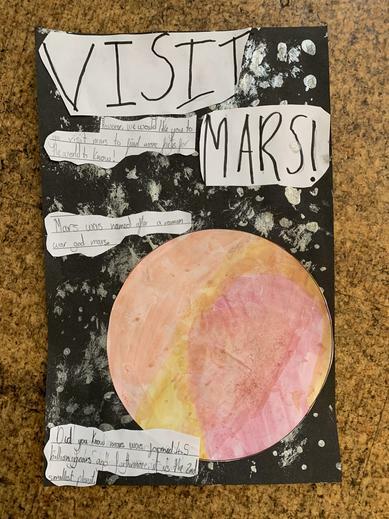 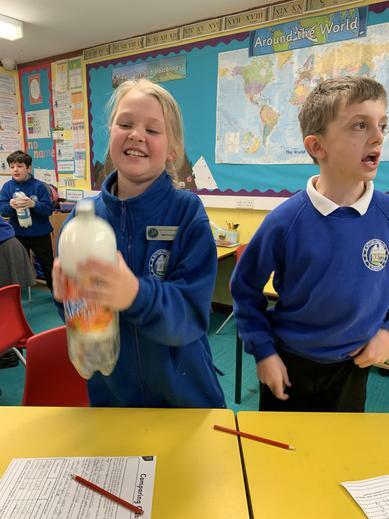 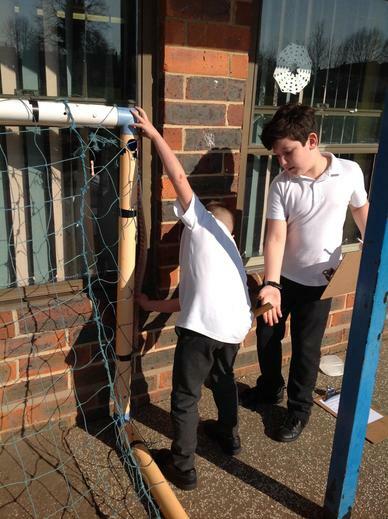 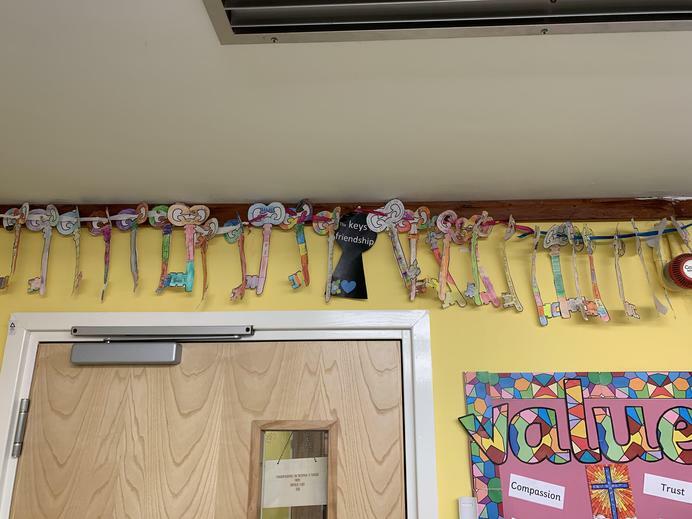 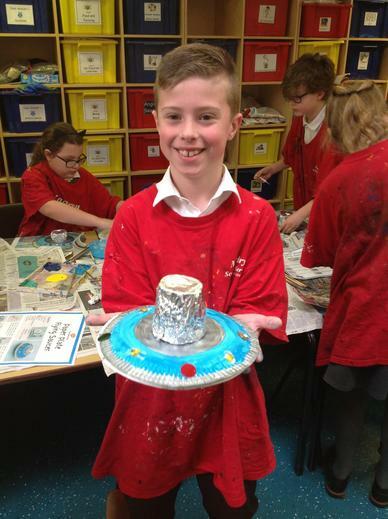 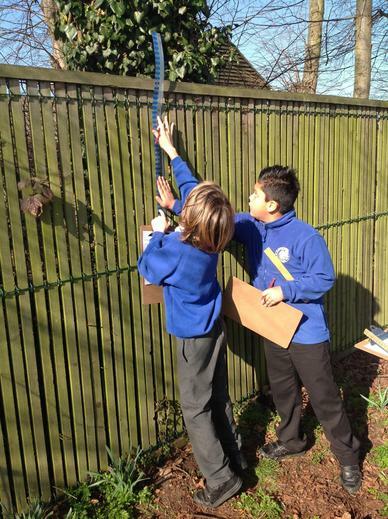 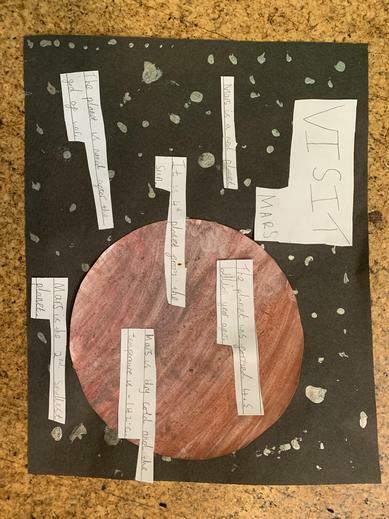 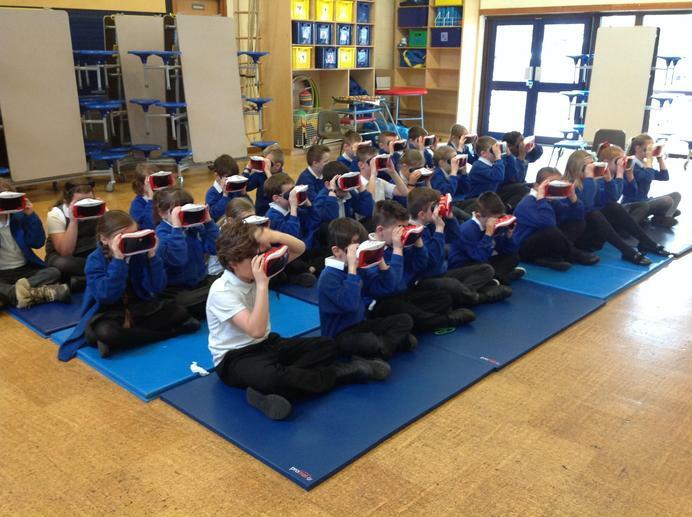 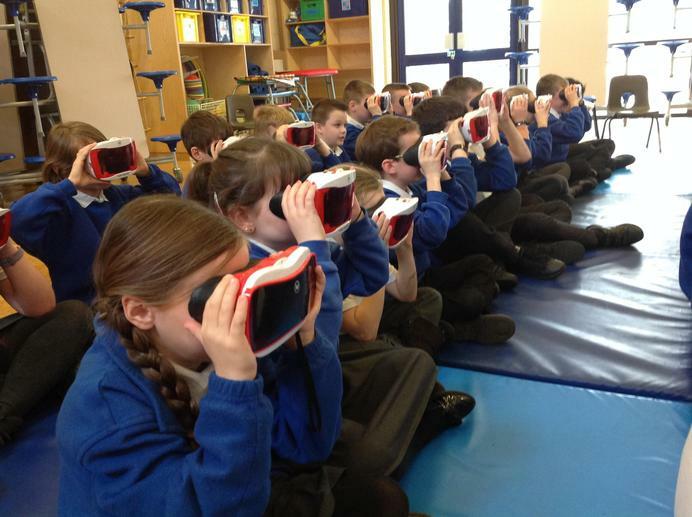 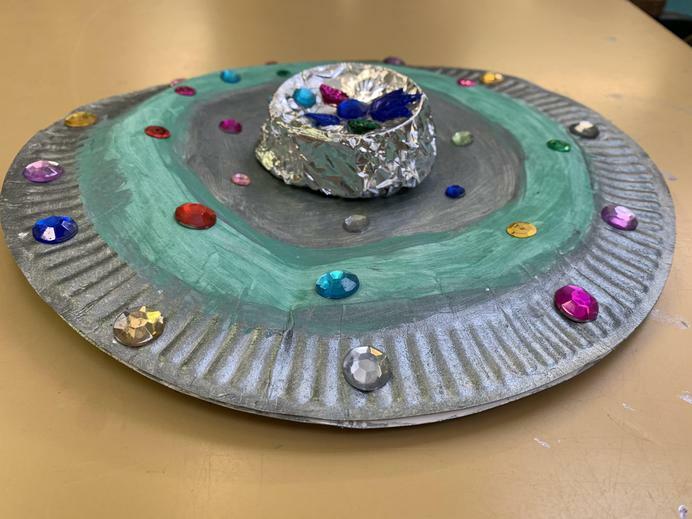 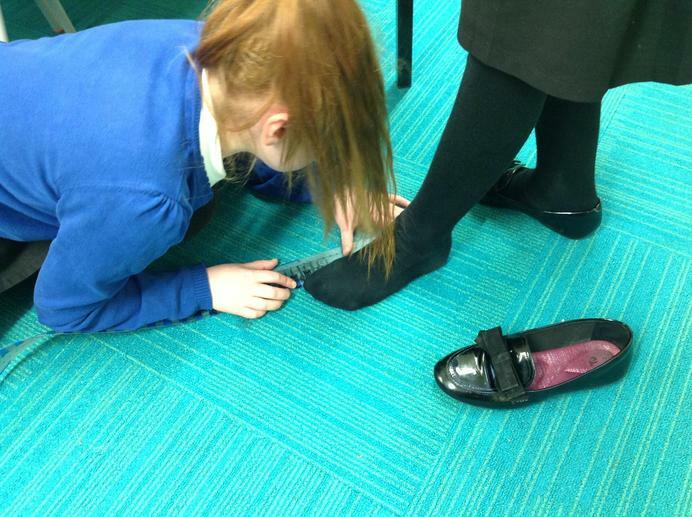 This was a fantastic way to explore where the Romans had been first-hand, including see some artefacts that they had been using over 2000 years ago! 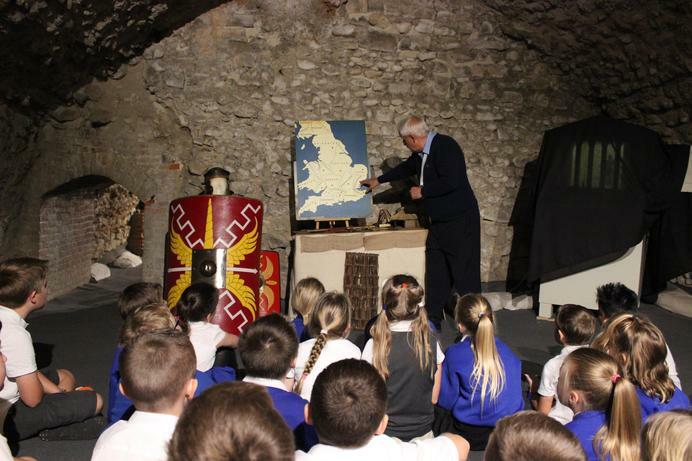 Our day began with a quick introductory talk by someone from the castle. 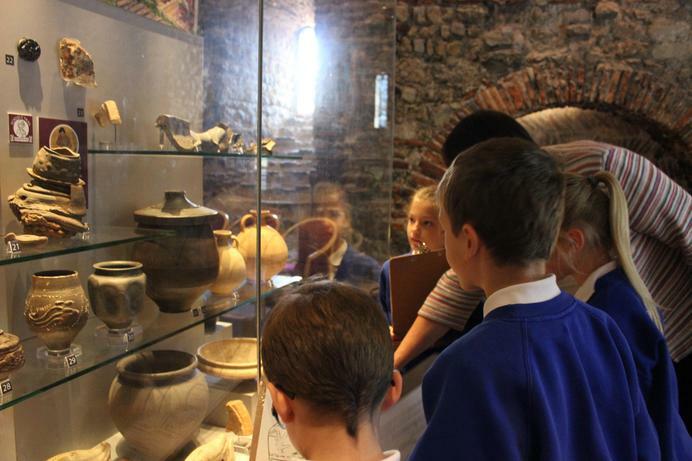 Next, we went and explored the Roman floor of the castle, looking at all of the different artefacts (some of which were even found in Colchester). 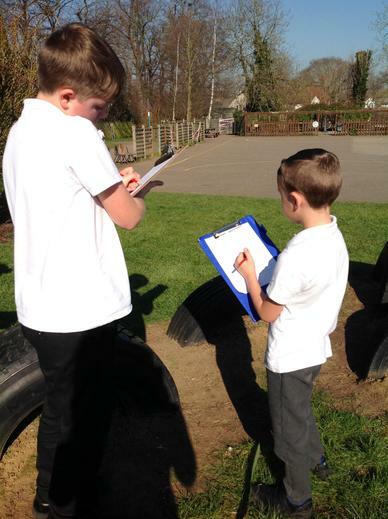 We had to find different facts out whilst we went round as well, following the 'Roman trail'. 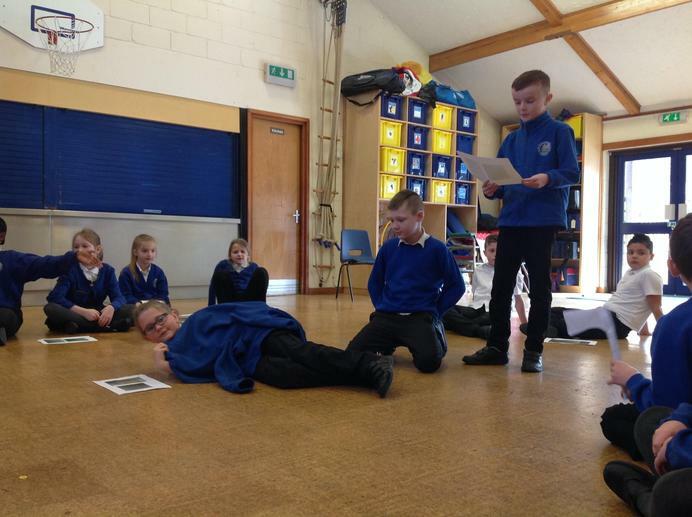 The Roman floor flows in chronological order, which really helped with broadening our knowledge of the topic area. 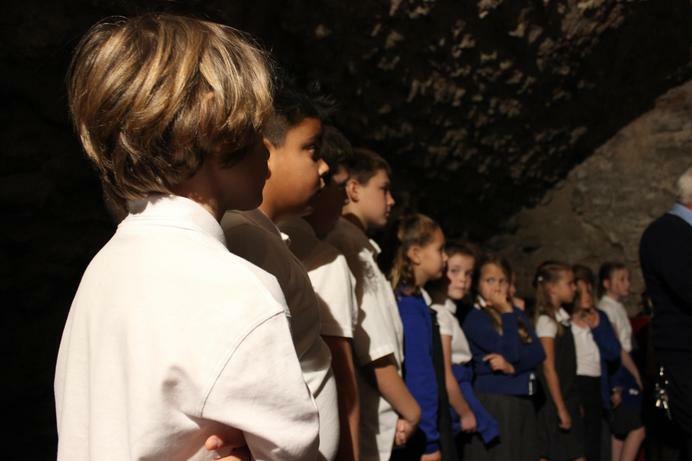 In addition, we had a tour of the vaults below the castle, which included looking at some weapons and where the Romans once hid from Boudicca. 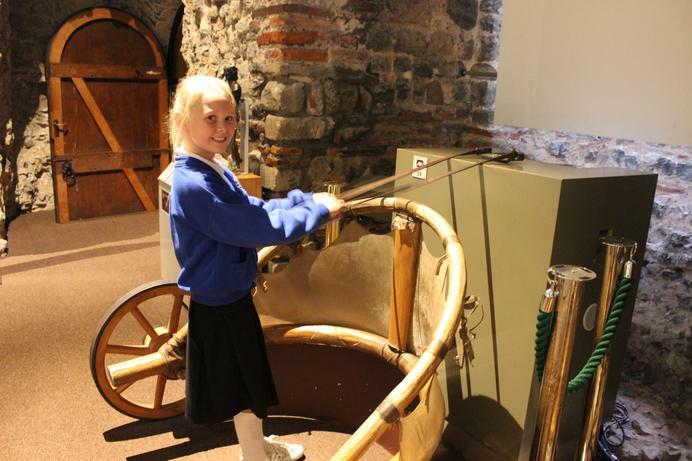 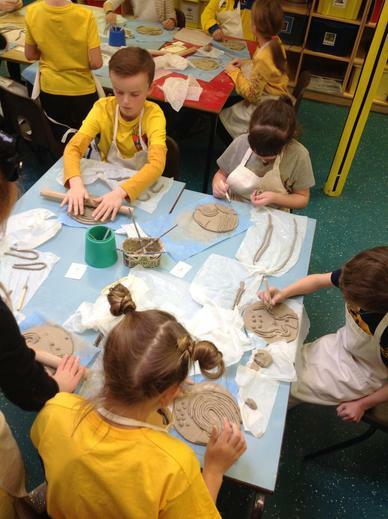 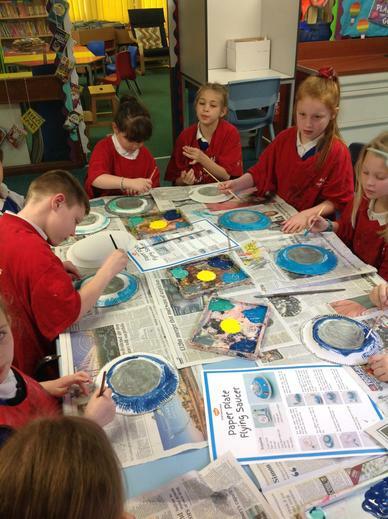 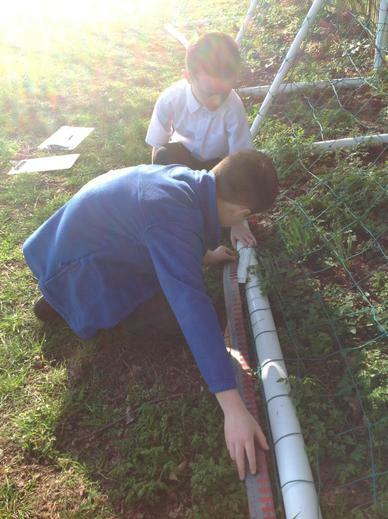 Finally, we had a go at building our own replicas of a roundhouse and Roman villa. 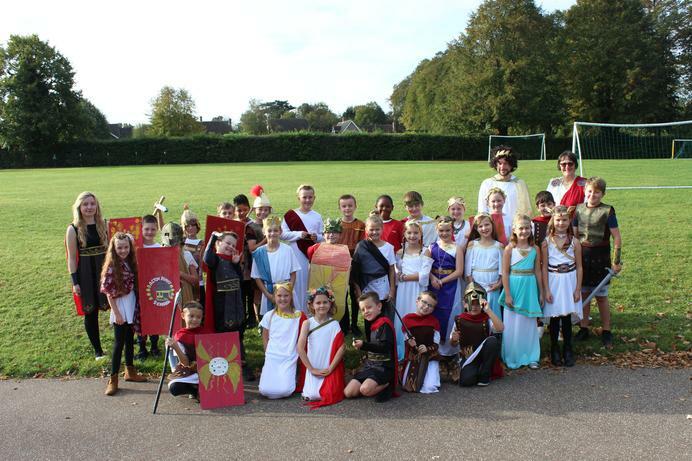 Considering it was October, we were lucky enough to have a picnic lunch outside in the sunshine, which made the day even better! 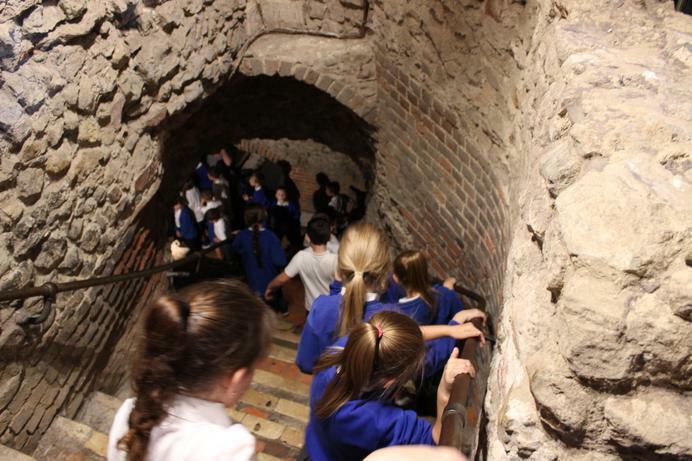 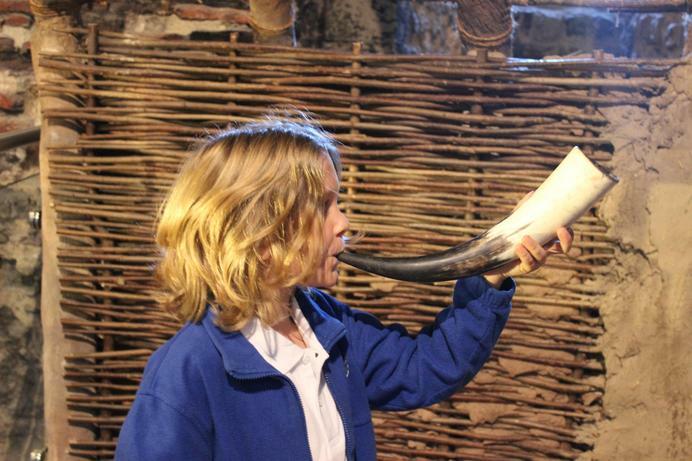 Thank you to all of the adults who came on the trip and to the staff at Colchester Castle - we had a great day! 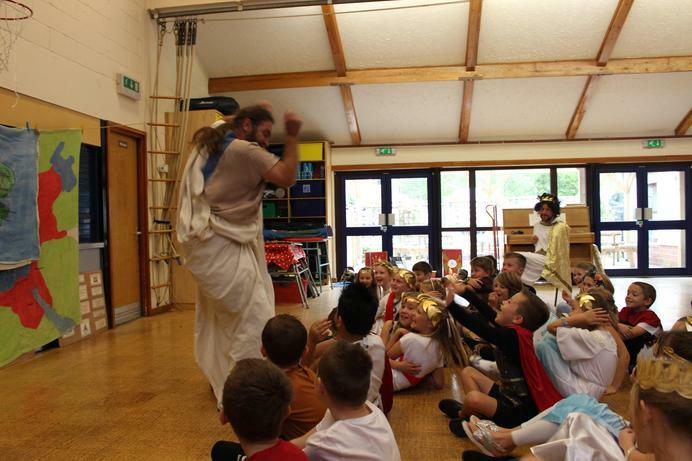 Today we had the most fantastic day dressed up as Romans and learning all about them! 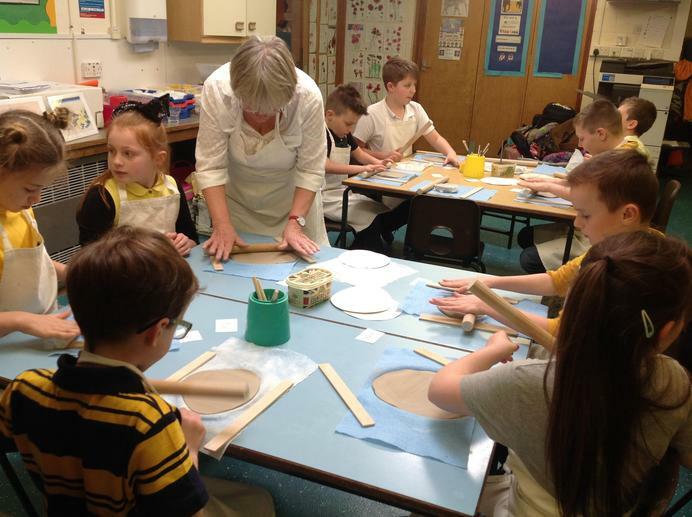 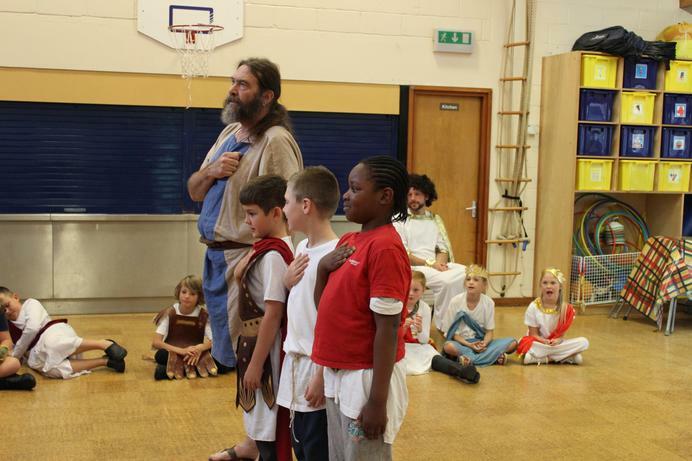 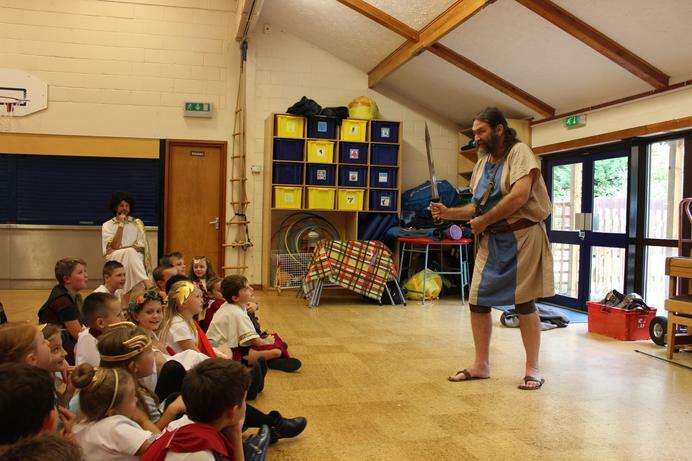 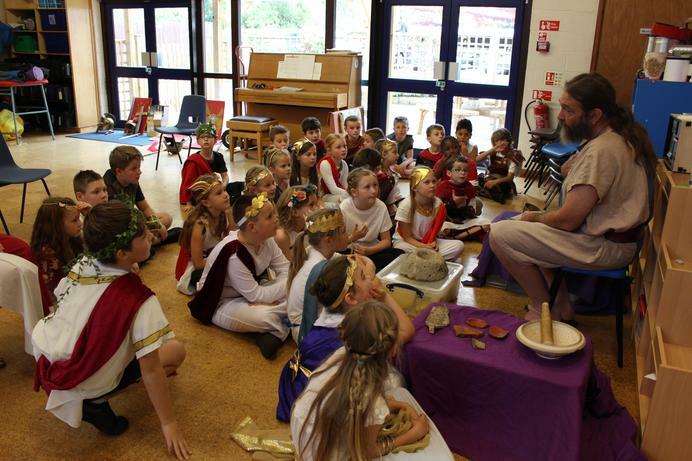 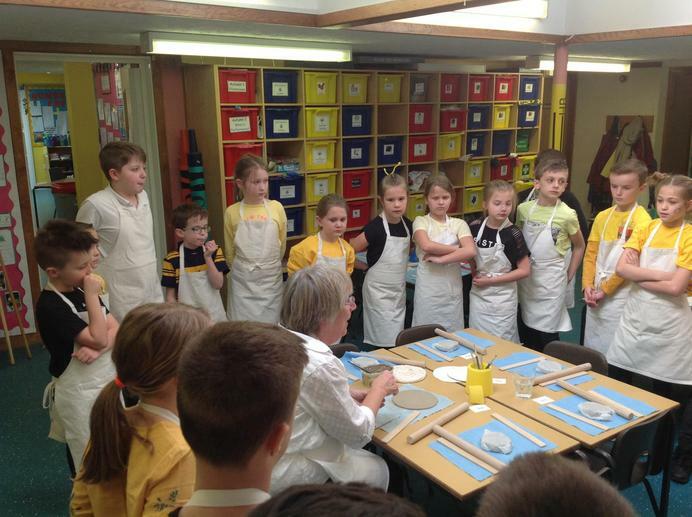 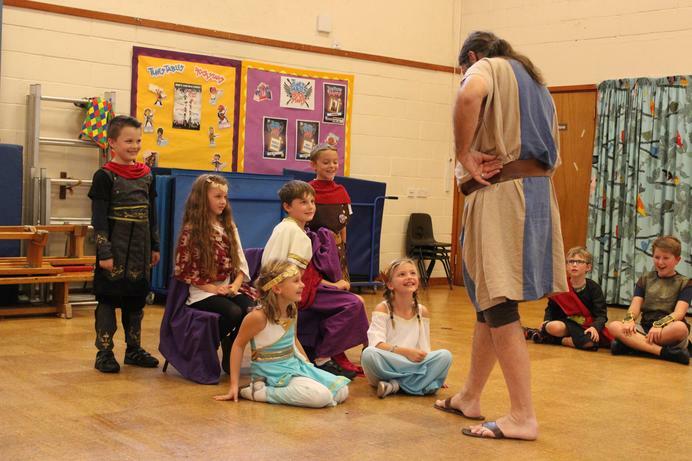 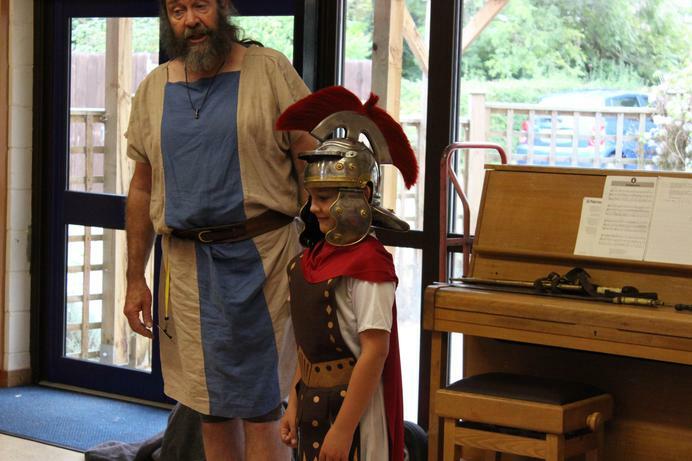 A member of 'Portals from the Past' came in to lead the day and teach the children more about the Romans. 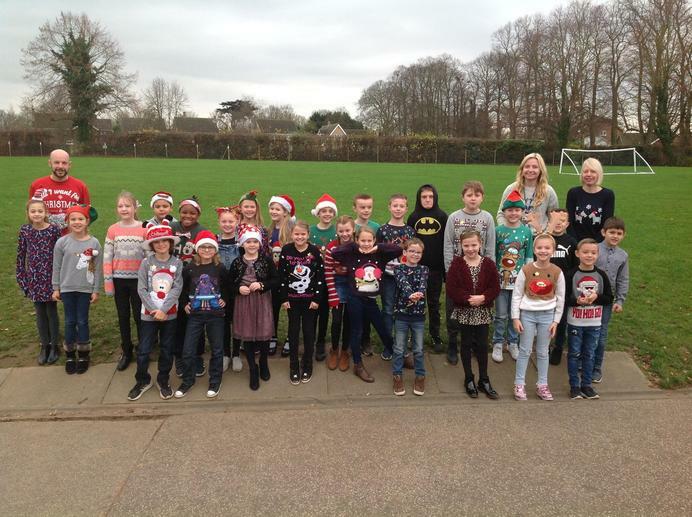 Our day began with a few class photos. 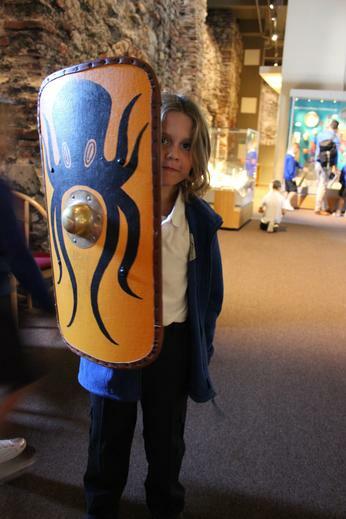 We then went into the hall to listen to a brief overview of the Roman Empire and what happened. 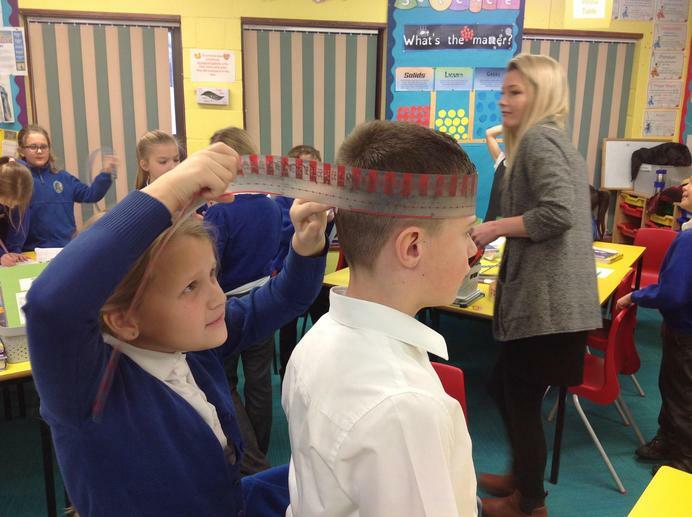 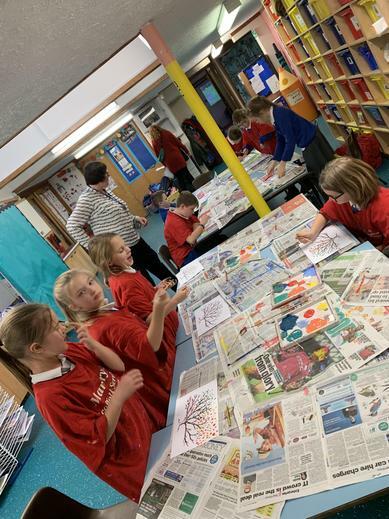 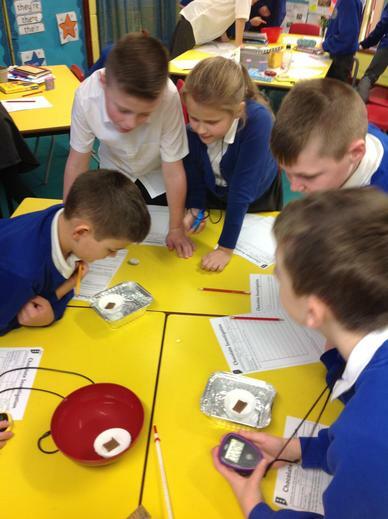 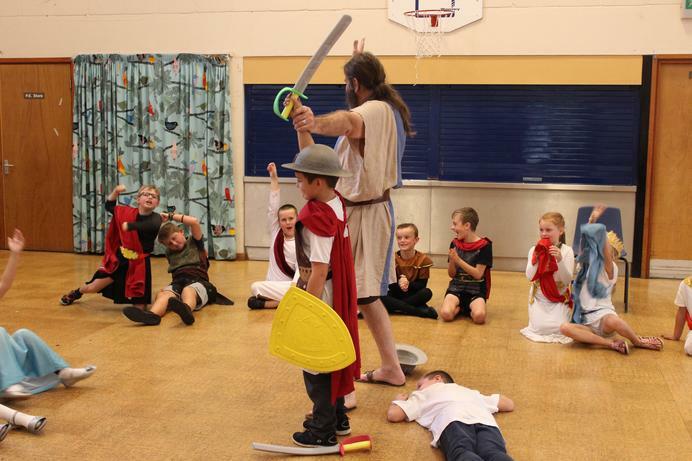 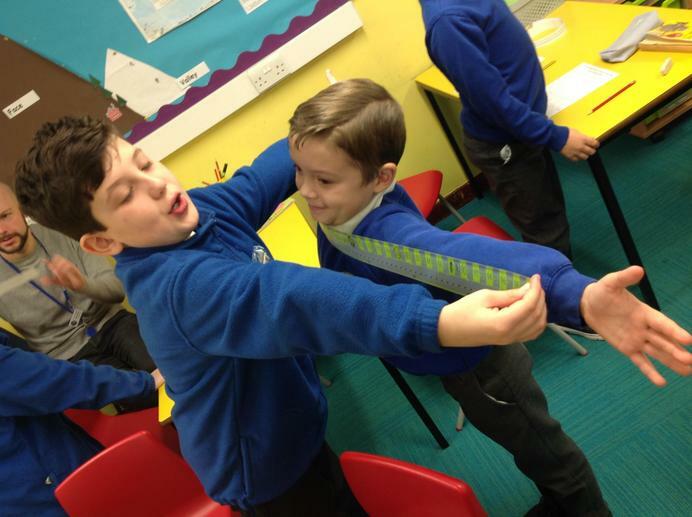 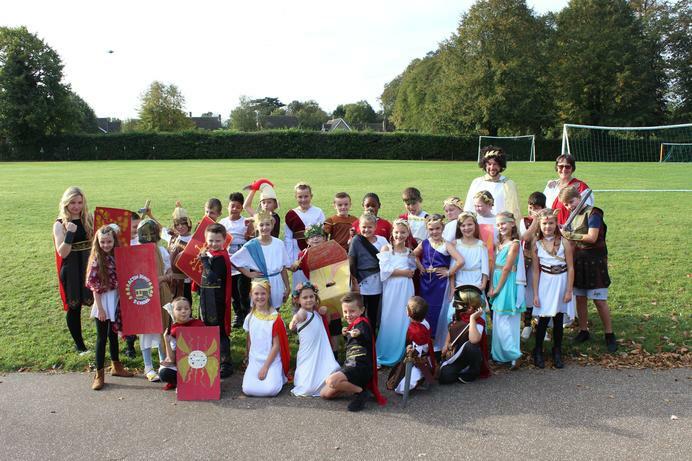 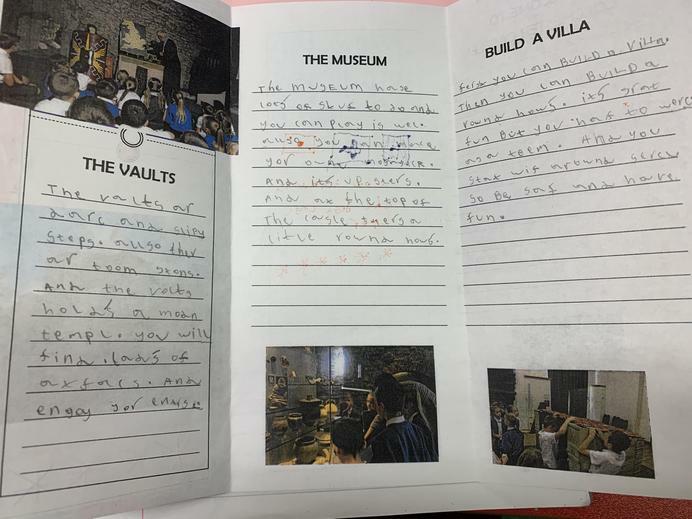 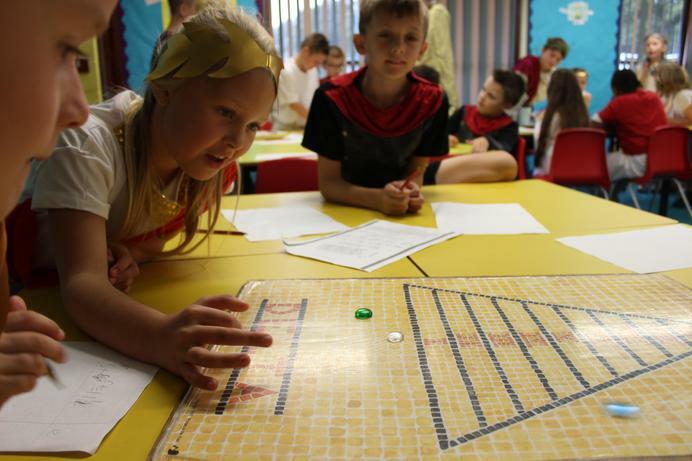 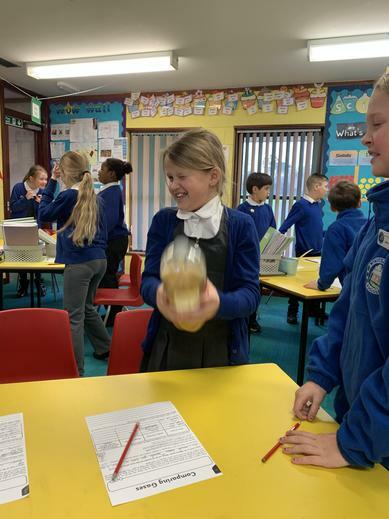 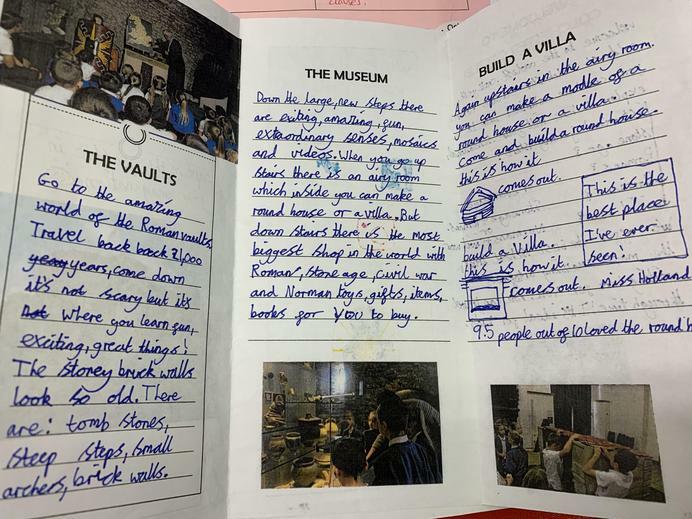 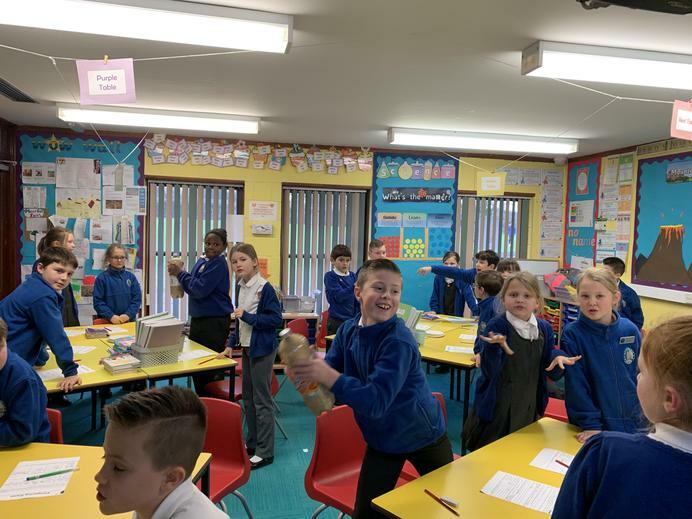 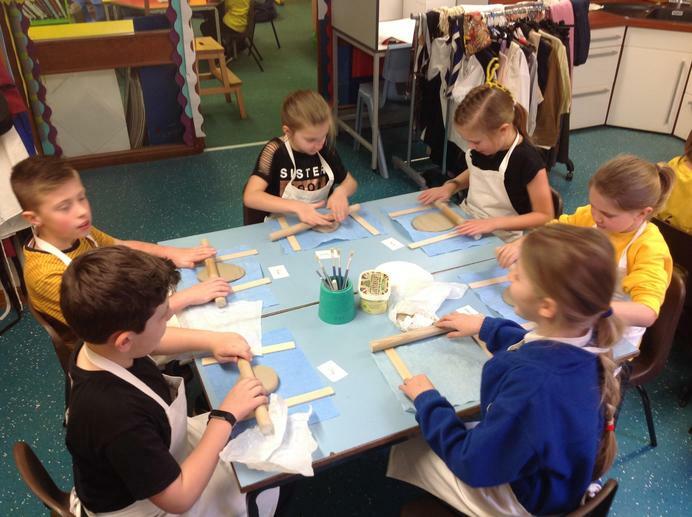 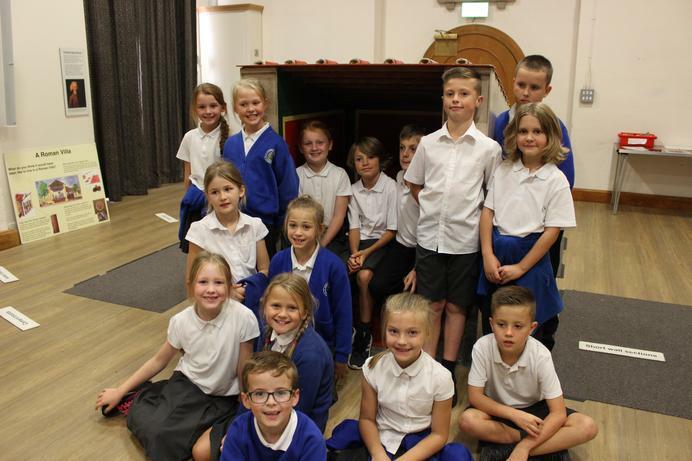 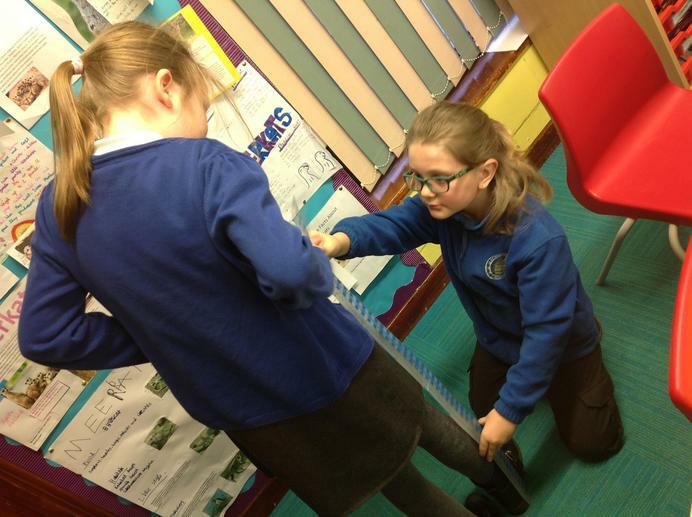 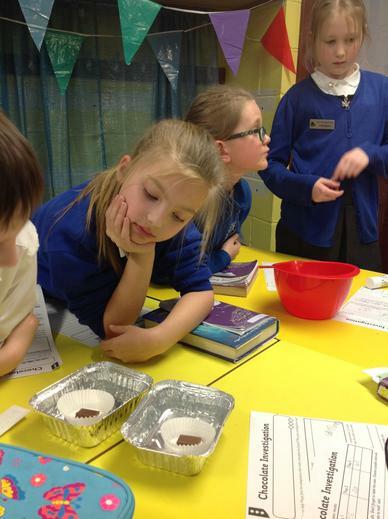 Next, the children went on a fact hunt and found out about various different Roman activities and ways of life, including chariot racing, importing and exporting goods and the army. 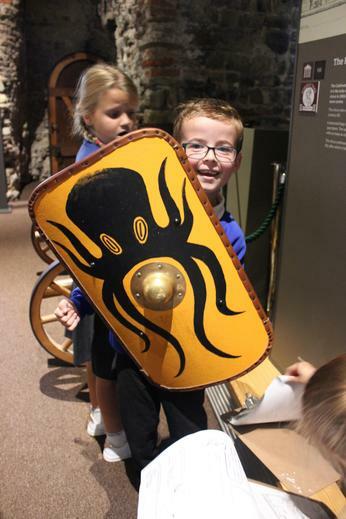 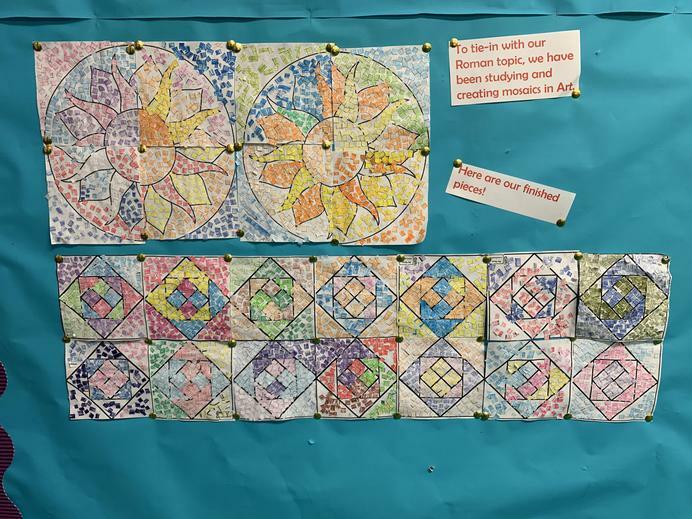 This was followed on by learning about and touching real Roman artefacts (including a piece of mosaic which links to our Art topic)! 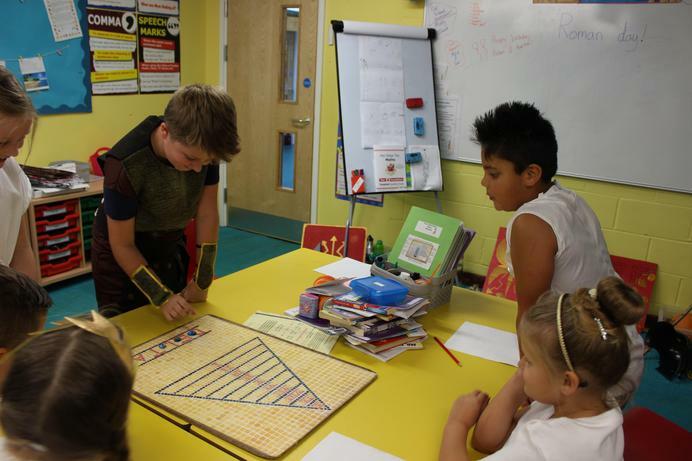 We also played a traditional Roman game that involved counting in Roman numerals (easier said than done)! 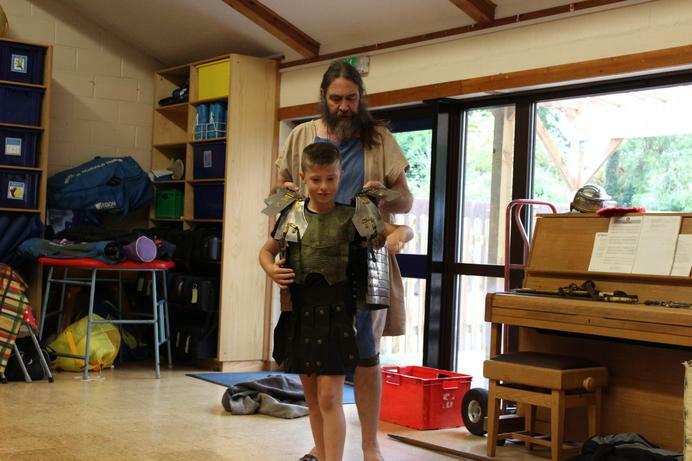 Finally, the children got a chance to try on different types of armour, before re-enacting some sword fighting between gladiators. 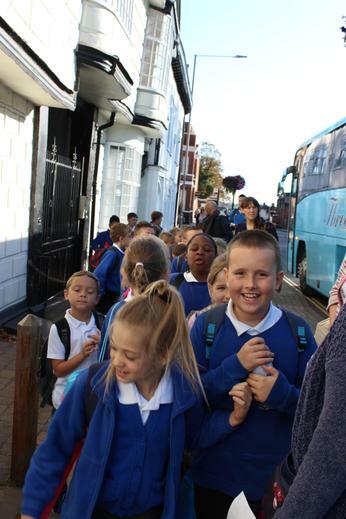 All in all, it was an amazing day! 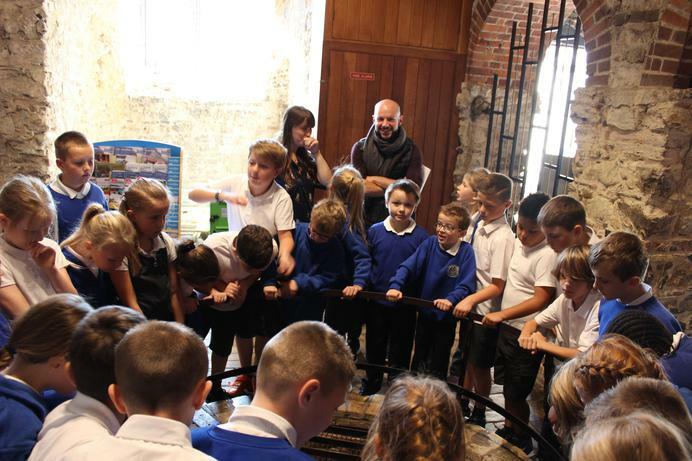 We are very grateful to Mike from 'Portals from the Past' for leading such an exciting day, and cannot wait for our trip to Colchester Castle next week!